CodeTwo Public Folders is now available on Android! CodeTwo Public Folders has finally made its way to Android! Last week marked the release of the new version of the program featuring the first build of dedicated Android app. Thanks to the new mobile applications you will finally get to access your public Outlook contacts, calendars and tasks from an Android phone or tablet. What’s more, the iOS version of the program is also coming up soon! The new CodeTwo Public Folders mobile app will give you the maximum of freedom in accessing your shared Outlook items, wherever you are and whenever you need. It uses the same type of connection with the Syncing Master as the desktop Client Apps on your PCs. It means your data is never uploaded to the Cloud and exposed to 3rd parties. The calendar entries, contacts and tasks are stored only on the linked devices and that’s what makes CodeTwo Public Folders so special and safe. CodeTwo Public Folders Android app in fact consists of three separate applications for managing contacts, calendars and tasks. They allow for creating, editing and removing your public Outlook items, exactly the same way as the Client Apps on desktop machines. After installing the mobile app from Google Play you will be asked to establish a connection with the Syncing Master. Before you do that your CodeTwo Public Folders desktop installation should be already configured (Learn more). You can also choose to test the application with the Demo Server first. In this scenario the configuration of your own Syncing Master is not required. Managing Outlook items with the mobile app on Android device is very simple. Given that the administrator hasn’t limited the access rights in the Administration Panel of the Syncing Master (Learn more), users can choose every public folder from Outlook to be displayed and synchronized. After that, the Outlook items are displayed in the dedicated Android apps and synchronized with other devices in real time. Whenever someone changes anything on any other device in the network, it will be replicated on other PCs and mobile phones immediately. Using CodeTwo Public Folders Android apps is free of charge for all users that own the license key for the current version of the program. However, in order to work properly with the mobile applications, the desktop installation of the program needs to be updated. Head on over to CodeTwo Public Folders download page and update your program now! 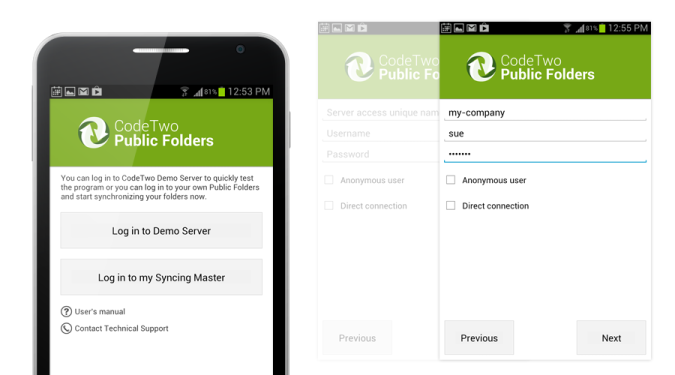 Ready to go mobile with CodeTwo Public Folders yet? Get the mobile app from Google Play Store and test it by yourself! If you happen to use an iPhone or an iPad at your home or office, keep checking on us here or on our Facebook fanpage. The iOS applications for CodeTwo Public Folders are set for their launch very soon. We’ll keep you posted!